How Do You Find the Rate of Change Between Two Points in a Table? 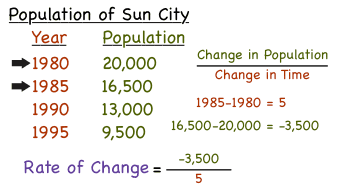 The rate of change is a rate that describes how one quantity changes in relation to another quantity. This tutorial shows you how to use the information given in a table to find the rate of change between the values in the table. Take a look! How Do You Find the Rate of Change Between Two Points on a Graph? The rate of change is a rate that describes how one quantity changes in relation to another quantity. In this tutorial, practice finding the rate of change using a graph. Check it out!